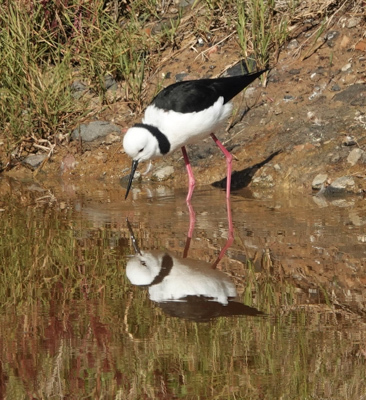 The first Black-winged Stilts have appeared after their winter absence on the edge of the drainage basin above the south-east corner of the Saltwater Lake. 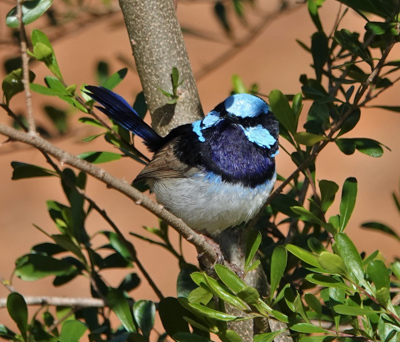 Lots of male superb Fairy-wrens are now in their breeding plumage. Other animals: One Red Fox briefly seen in the saltwater lagoon area on the south side of the Saltwater Lake. One Brush-tailed Possum. Common Froglets heard in dam and wetlands near the Friend’s Compound. Habitat: Similar to last month water levels of both large lakes are very high, but wetland bird populations of most species are very low, except for Chestnut Teal, Purple Swamphens and Dusky Moorhens which are present at average numbers. Noisy Miners are now regularly present along the eastern edge of the park abutting Todd Road. Six birds were recorded today with other honeyeaters, including White-plumed Honeyeaters and Red Wattlebirds still foraging nearby without being driven off. A Red Fox was briefly seen running away between Saltwater Lagoons 2 and 3. Foxes are a significant threat to the waterbirds, especially when they are breeding. This fox could well be the reason for the loss of two cygnets (one in May, followed by another in June) from the original six that first appeared in late March. The Painted Button-quail first seen in the park on 12 June is still present although we were unable to find it today. The bird (or number of birds?) has extended it range over a much larger area mostly on the north side of the Large Freshwater Lake, leaving lots of fresh Circular shallow scrapes as evidence. Two White-naped Honeyeaters, one being pursued by a New Holland Honeyeater, were seen in the vegetation around the dam.